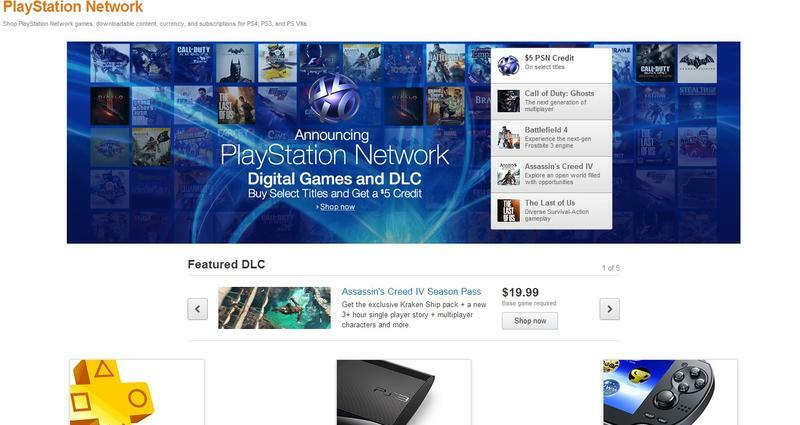 Amazon now has a PlayStation Network Store. All of the digital goods you'd find on the PlayStation Store from your PS Vita or PlayStation 3, and eventually the PlayStation 4, can be purchased from Amazon. With the launch of the new store comes a $5 credit giveaway. Buy any game from a small stack of titles, which you can find right here, and you'll get a $5 credit on your account. Alright, so, why is this particularly good news? Well, the reason for excitement, at least in my book, comes two fold. First, buying content for yourself and others is extremely easy on Amazon. Make the purchase using gift cards or whatever, and get the code for yourself or a friend. Second, and this is the big one, Amazon has always had a penchant for discounting goods and content. We might see more regular sales, and, even better, we might see old downloadable content more appropriately priced. Having more storefronts to choose from when buying goods is always great news. Personally, I think this addition is big for PlayStation.